Commentary of the famous book titled Nuzhatun Nazar Fi Tawdeehi Nukhbatil Fikr of Hafiz Ibn Hajar on the Science of Hadith. 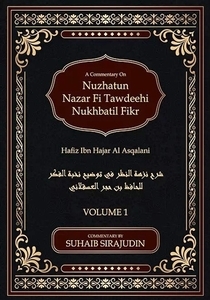 Althaugh Nuzhatun Nazr is itself an Explanation of Nukhbatil Fikr by Ibn Hajar himself, however it is still a very concise book that brings the early and the later schools of the Muhadithin together whit the most accepted method of approving hadiths as well denying the rejected. It was felt that The Commentary of the Commentary needed more explanation to clarify things for the Modern Students of Hadith, Shaykh Ustadh Suhaib Sirajudin has therefore done great service for the benefit of contemporary students of Hadith. Imam Ahmad ibn Ali al-Asqalani (d. 852/1448), famously known as Ibn Hajar after one of his ancestors is arguably the best hadith scholar of the Mamluk period. The Dhahabi of his time and the amir al-muminin of the hadith scholars. Imam Suyuti says that he drank from the well of zamzam and prayed to Allah to give him more knowledge than Shams ad-Din adh-Dhahabi. He is the author of over 300 books some going into lengthy volumes. He died on Friday 28 Dhi al-Hijja 852 hijri and was buried in al-Qarrafa, Cairo, now famously known as the City of the Dead (madinat al-mawta).